Here is an easy method designed for everyone, even users without an advanced technical knowledge. This documentation is detailed and explains the process step by step. From the menu on the website, go to Sources. In the part "Source Center", click the first thumbnail "Webcomic". On the new page, click the episode you want to translate, e.g. "ep01 : Potion of Flight". Click the "Translator's pack" button. The download of the zip will start. Decompress the zip file to a folder of your choice. Remove the zip file to clean-up. Congratulations! You now have the translator's pack of a Pepper&Carrot episode on your disk! Note: If you have a fast internet connection and enough disk space, you can also in one click download all episodes instead of downloading the episodes one by one. Every episode source folder has a subdirectory called lang. This folder contains all languages that are already available for the episode. Duplicate an existing language using Copy/Pasting (eg. "en" folder for the English version) and rename it to the language you want to translate. On Pepper&Carrot we use two letters only. We try to use ISO language codes, but if your target language doesn't have a two letter ISO code, we can invent one. Inside the folder you just created, just edit all the SVG files with Inkscape. 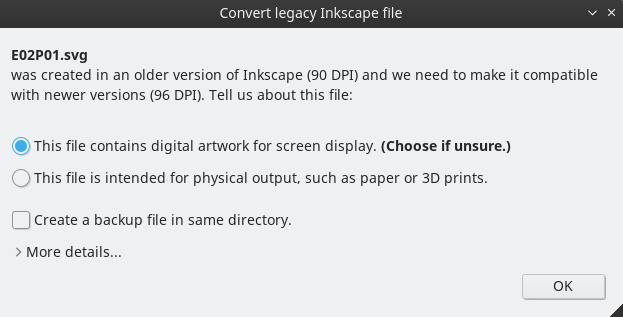 Note: If Inkscape prompts you with a dialog window at start-up "Convert Legacy Inkscape file" looking like that, just keep the default option "This file contains digital artwork for screen display. (Choose if unsure)" and then press the OK button. Translate the content of speech bubbles, change the sound effects, resize speech bubbles to make them look good with your new content. You'll find more Inkscape tips in this documentation (in the menu on the left and even in the F.A.Q). Feel free to be the art director of your translation: resize stuff and arrange the layout to your taste. Don't forget to fill in the credits for your translation on the credit page (the last page). When your translation is complete and looks good, it is time to send it to the Pepper&Carrot official website. Before doing that be sure you agree with the terms and conditions. Take a minute, read it. Open a free account on Framagit. Framagit is the collaborative tool we used for the file management and bugs. It is hosted by the French association Framasoft. Then we will notice your message, discuss and will grant you permission to upload your files to the source. You'll join the long list of Members as a Developer! Open the Branches page. Or you can find this page by clicking "Branches" on the header of the repository https://framagit.org/peppercarrot/webcomics . Click the top-right colored button "New branch". Setup your new branch. The branch name is a name up to your choice, just think of something without spacing or any special characters (eg. ep26-fr, fr-corrections, mynickname-fr). Leave other option unchanged: "Create from master". click the button "Create branch" on bottom-left to complete the creation. Open the page of your branch. This one is listed on the Branches page. Click on the title of your branch in bold. You'll see a page with a big listing of all the sources files of Pepper&Carrot. Click on the episode you translated (eg. ep01_Potion-of-Flight), then on the subfolder lang. On top-left of this listing, you'll see the name of your branch. On the right of this name, you'll see a button [+] (with a plus symbol on it) looking like that. Click it. Select "new directory" and then enter the two letters of your translation folder (eg. fr) and leave Commit message and Target Branch field unchanged. Validate with the colored button on the bottom-left corner "Create a directory". Inside the new create folder, press again the button [+] (with a plus symbol on it) and this time select "Upload File" and enter in this one the Inkscape SVG files of your translation. Finish by the colored button "Upload file". On the top of your branch (listed in the branch page), press the button named "Create a Merge Request" and then fill the form; you can add a Title to the change you did and then write a longer description. When you added your title and description, leave all the other part unchanged and scroll down to the colored button "Submit merge request". Congratulation! You sent a translation to the Pepper&Carrot team! After that, the Pepper&Carrot team will be notified to read your Merge Request title, description and also will be able to see the files you added or changed. It is a perfect time for us to discuss and review the changes before accepting them in the official code. Framagit will ease this part because everyone in the project can comment on the Merge-Request page. If everything is fine, the Merge Request will be accepted and the files and folder will join the main code. The branch will be deleted on the process. If you want to continue your work on the translation, repeat the process from (b.) to (d.). Note: The comic page will appear within around 48h on the Pepper&Carrot website. Continue to work on the files on it using the button [+] (with a plus symbol on it), the Delete or the Edit button on top the SVG files. Framagit offers many options. That's all: The changes will appear automatically on the Merge-request discussion thread (all Merge-request are listed here if you can't find it).